I love how wax transforms your art and takes your creativity to a whole new level. While I was in Mexico last fall I had the privilege of meeting, creating and becoming friends with Kathie Vezzani. I loved watching her create and the freedom she had with color as she painted. I asked her to come and teach on my site before the retreat was over and I am so excited her course is now less than a month away! 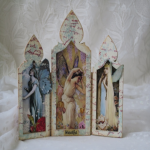 Mixed media artist, Kathie Vezzani, loves to share her love of all things plaster and wax. 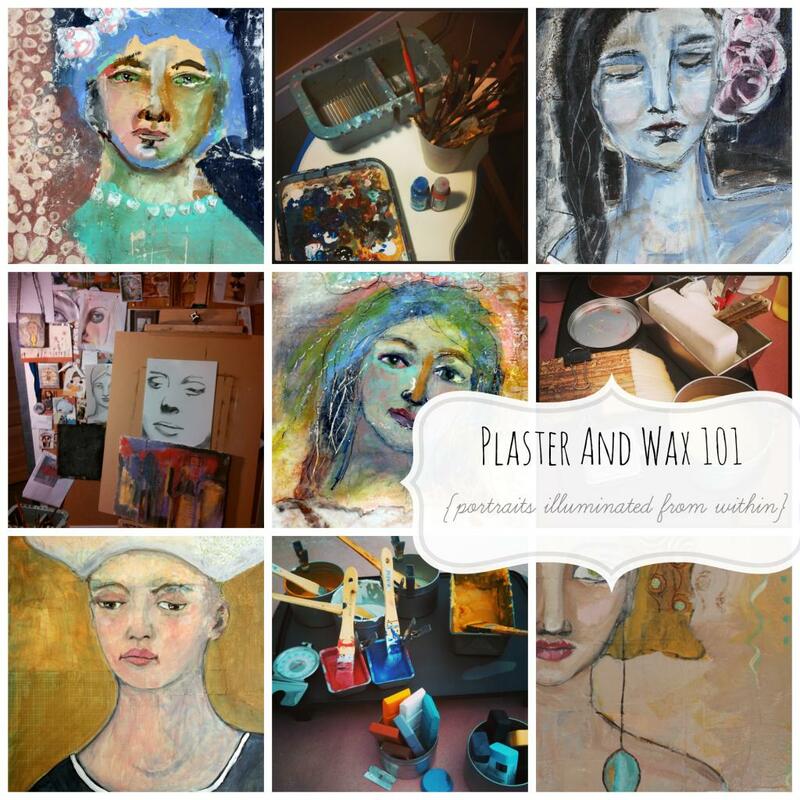 Join her in a 2-week course that will take you on a playful journey of creating in plaster and encaustic wax. This is a beginning course that will introduce you to the basics of using these two mediums, including safety procedures and tools. Plaster is a luscious, absorbent surface that begs to be scraped, carved, sanded and painted. A very old, raw medium used to make the ancient frescoes we see in Europe, Kathie will take you on a journey to paint your own masterpiece. She will go over the basics of painting a face, show you how to paint a “pretty face, “ then using her own style, show you that you don’t have to paint realistic faces that conform to the rules. 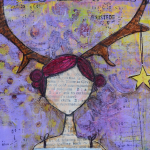 When finished, she will show you how to apply layers of encaustic medium to make your painting seem illuminated from within, adding oil paint to soften the edges or add splashes of color. Adding, removing, distressing and layering, so many possibilities when working with plaster and wax! This two week course will begin on May 19th! The content is available for one year. This course is available for one full year. 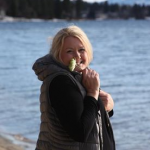 I wanted to do a fun giveaway to celebrate Kathie’s first solo online class and also to remind you that there are only days left to get the early registration price. Kathie wanted to give one of you an original encaustic painting and I want to give one of you a box full of Kathie’s favorite encaustic supplies! 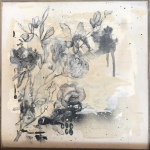 Kathie is giving away one of her original encaustic painting valued at over $100. To enter for a chance to win the original painting or the art supplies please leave a comment on this post sharing what medium you want to learn to use next. I will announce the winners of the original painting and art supplies next week! The price will go to $35 on May 1st. 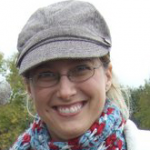 You can go directly to jeanneoliver.ning.com and register for the course by clicking HERE. Oh my, I would love to win either one. What a lovely giveaway! I would love to take this course as I have long been fascinated with encaustic. Maybe I’ll find a way to swing it…. All signed up for the course and super excited! Thank you for the generous giveaways! Hmmm, next I would like to learn about…I will get back to you on that answer as there are so many things yet to learn! Thanks and Happy Wednesday Jeanne! I’d like to use shiva oil sticks for painting faces. I’ve tried it but have a hard time with details on face. And great giveaway; thanks for the chance. I would love to learn how to make mosaics. Thanks for this opportunity. This class looks intriguing. the way the colors so smoothly flow into each other…. the depth and texture that the wax gives paintings. i have been looking for an encaustic class for a long time, and how wonderful to find this on line!!! i also love the idea of learning to work in plaster. thank you Jeanne for providing this class. 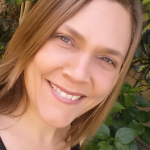 i have never done an online class and think it is going to be fabulous. 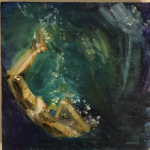 i am trying to develop myself as a mixed media artist so i am interested in any class that will build on this foundation. i also have signed up for the Building a Creative Business class. My dream! I have shared by pinterest and facebook. I’ve been interested in encaustics for some time, so when this class became available and for early registration I jumped at it. 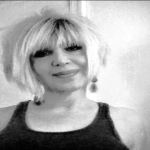 You can not go wrong with any of the classes given or sponsored by Jeanne the content is always over the top. I have taken many of her courses and have been super pleased. I’m so excited about this! I would love to learn to paint with wax!!!! I have sealed my painting with wax but have never tried to actually paint. Thanks for the chance! I want to learn about plaster next. Thank you so much for offering this class. The class looks gorgeous. I wanted to play withencaustic a long time, so i hope to learn it. I have been very interested in encaustic for quite some time. However, i haven’t been brave enough to try it. This course gives me the opportunity to learn at a beginner level. I am super excited for it to begin! I’m so excited for this class to start!! I love using plaster in my mixed media paintings and I can’t wait to learn more about encaustics. And also shared on Facebook. Ooooh! I’ve been wanting to learn about encaustics!!! How fun!! all signed up & can’t wait to begin. what an amazing class! I have been super eager to learn more about encaustic for a long time now and would love to learn how oil paints play a part too! :) Thanks for an amazing giveaway! What would I like to learn next? I’m very interested in metal, but I’m open to anything. I’ve always wanted to learn encaustic, but it’s really not in my budget right now. I’ll be cheering from the sidelines, though! I’ve never done encaustic so that’s on my list but I also want to learn pan pastels and oil sticks. What a wonderful give-away! I’m very interested in encaustics! I just pinned the course. I just pinned the course. I would love to learn the plaster and encaustic techniques. What a great giveaway! I enamel, so I’m all about color. I’d like to learn how to use pastels. Thanks for the giveaway opportunity! last summer, we spent some time touring a gorgeous converted barn studio and learning about encaustic medium from the artist & I have been intrigued ever since. it is the next medium I want to try. I just pinned the class and also facebooked about it. I would love to learn more about plaster and encaustics. Can’t wait to begin. Many many thanks! I’m excited to take another wonderful class through Jeanne Oliver. This looks so yummy I can’t wait. Encaustic!!! Happy to see you offering this course. I’m so excited for this course to start–I’ve wanted to try encaustics for ages, but didn’t know where to begin. After this . . . well, I want to learn it all, but something comparing the different types of painting would be great: watercolor vs. acrylics vs. gauche vs. oils . . . Thanks for the giveaway opportunity! I am ready! Woohoo!! Fun gonna happen!! Intriguing class…planning to join…thanks so much! Registering now! Fascinated by encaustics since a trip to Savannah where I saw the magic of the this medium. I have played around with it but need this class. I have been searching for a class and was delighted with your announcements! Can’t wait! So excited to learn encaustic techniques. And I am very curious about plaster as a medium. Sounds like a great class! And as always, a most generous give away! How exciting, I would love to learn about encaustic medium in this class but also oil pastels and watercolor. Thanks for a chance to win. What a nice giveaway. I am enrolling for the course, as I have wanted to learn more about encaustic painting for a long time! I love bees wax and have been interested I encaustics for some time.What an awesome opportunity, thank you for this chance. I have never worked with encaustic wax and look forward to learning about how to use it! Would love to try encaustic. I would love to learn about Encaustic. Been I terested for a long time. Will sign up for the course. I’ve always wanted to learn encaustic so I have registered. Can’t wait to get started!!!! Wow! What a wonderful giveaway! I am learning watercolor at the moment, but I’d love to learn about encaustic wax. I’ve had wax over a year now, but have been afraid to try it. I never knew what encaustic wax class was, but I would like to learn about it. Oh Jeanne!! I would LOVE to win this!!!! 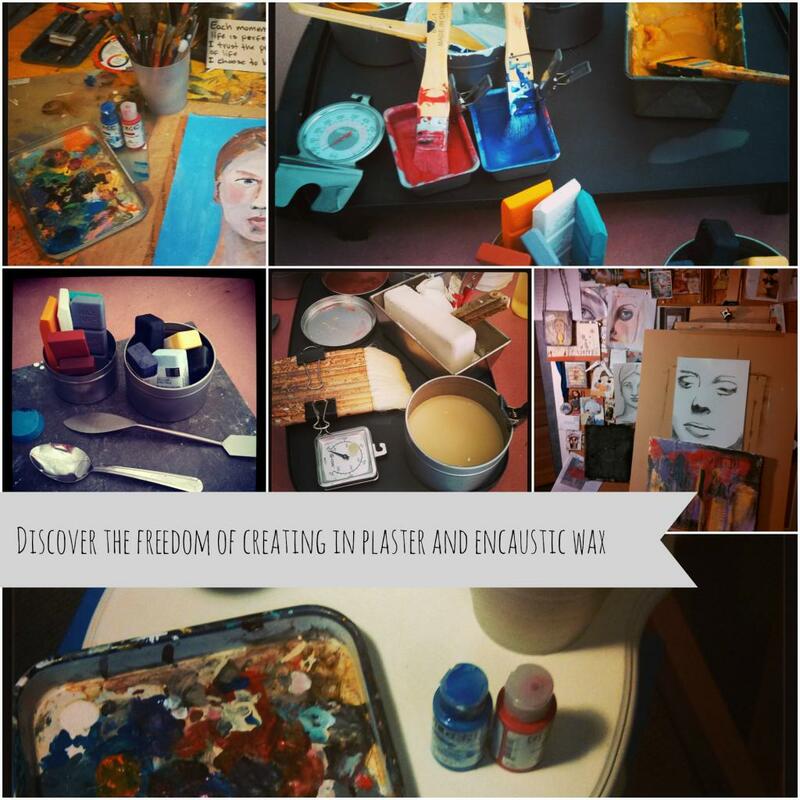 I am a Plaster artist and have been dying to learn encaustic! I never dreamed about combining the two! This workshop is going to be AWESOME!!! YEY!!! I have been dying to get into encaustics. Love the waxy look. I am off to sign up immediately. Can’t wait! I’m in! I have oogled and ahh’d over encaustic artwork for years. It’s time I take the leap! Just tweeted about the course! I am signing up and anxious to learn this process! Thanks for the great giveaway! I have posted on Facebook! 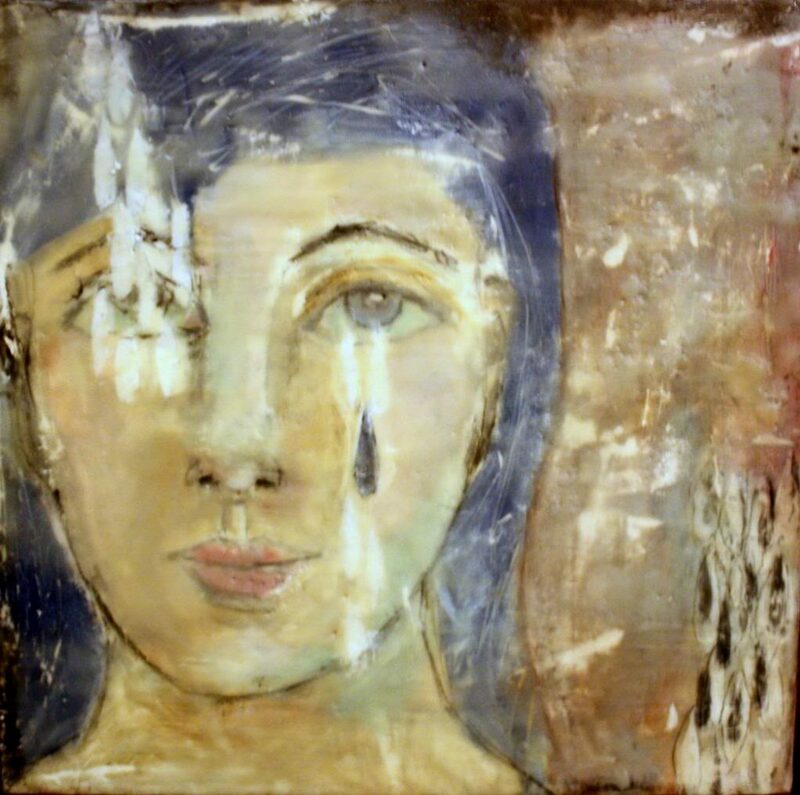 plaster and encaustic and portraits sounds like a dream made in heaven! 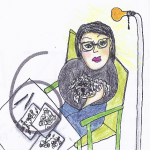 Hi Jeanne, Your online art classes are always content rich and very well done, so I’m sure this one will not disappoint. How about a class that teaches monoprinting? Thanks for the chance to win a great prize. I would love to win either one!!! how exciting! I am all signed up for the class. Super excited . I want to do more 3-d work using encaustic and mixed media. Left a comment and liked this class on Facebook. I love all art mediums! I do work with inks and acrylics right now and have always been drawn to encaustic.There is something about wax that is so interesting in texture. 🙂 Your classes and the ones you share are always so inviting for discovery! Thank you for the opportunity for the giveaways. Oh these supplies look yummy! Believe it or not, I have actually had my eye on encaustics! I also want to try wood burning. I would love to win either prize . . . wow! I would like to learn more about paper clay and “sculpting”. I enjoy learning to use different mediums and learn artists favorite mediums and techniques. Thanks for this chance to win. I would love to learn how to how to use the oil paintstiks for faces. I have heard good things about Cedar Canyon brand. I am really excited about learning how to do encaustics, and would love to win the supply kit!!!! Thank you for sending the info about encaustic. I have done some work but love to learn Katie’s techniques how to paint faces. They look absolutely stunning. I signed up!!! Love the chance to win. I love the different courses you provide. As an early childhood teacher in Australia, the art courses you provide help me learn about different art mediums, I then use my new knowledge to create with the children. I would like to learn about creating with felt next. I have also repined this course onto ‘ECE Pedagogy’ board on my Pinterest page. Just tweeted about the class! Your giveaways are amazing! Thank you! I would like to learn encaustic! I have 2 friends that have tried it and love it, and I know I would too! Hope to take this class to learn it! I am really excited about this class! I’ve never tried encaustics before and I can’t wait to learn how! Totally jazzed about leaning encaustics! I love material and was wanting to lean more about resists with wax! For so long and not used them. Totally obsessed with the mix media world. Love learning all there is to know. Now it’s time to take the leap into the encaustic side!!!!!!! I signed up the second, I heard about this course. Winning the beautiful set would be fantastic!!! Soo looking forwards to the class, I am crossing out the days on my calendar, as if i was a child and going to Disney. Learning is my Disney! See you soon!!!!!!!!!!!! I have my supplies so all I need is someone to point me in the right direction. This looks like more fun than playing in the mud! 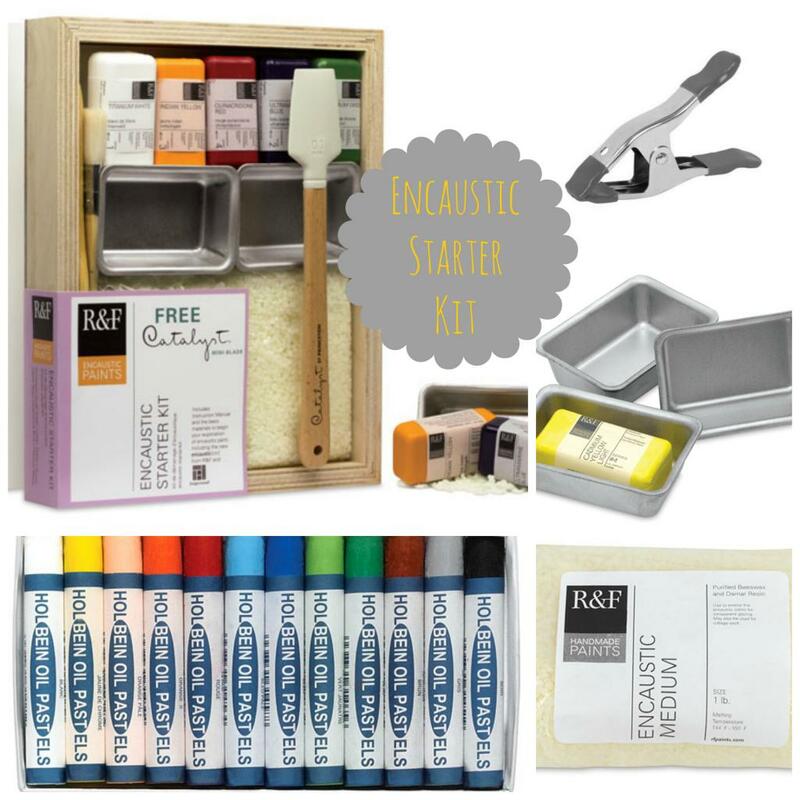 I am so crazy about encaustics and would love to win this starter kit!!! Thank you. This looks like a very interesting class & I’d love to win a spot! I’ve been wanting to try encaustics for a long time but there aren’t many inperson classes near where I live. this one will be perfect! The next medium I’d like to learn is wax. Always interested but never actually got the supplies…so yes, it would be awesome to win these supplies and sign up for the class. I want to learn encaustic, that’s one reason why I signed up for this class. Thanks for that and for the opportunity to win. Oh! Love it! 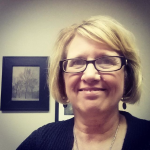 I am registered – the supplies are awesome! I always love learning new techniques in art. I especially love techniques that showcase the magic of light. I think that encaustic does a beautiful job with luminescence, and look forward to learning it. Pinned the course in my Design Inspiration Board! Oh my goodness, this class looks so inspiring and interesting! I have used beeswax to finish some of my pieces, but have never played with the colored waxes! I would love to win either of these fabulous treats! I must sign up for this class, it will be the perfect thing to come home to after the Italy Retreat! So looking forward to that! Thk you for giving us such a broad range of classes and introducing us to so many talented artist! I am already in love with Kathie’s work. I have been aching to take a class to learn encaustic painting! The plaster portion of this class is just such a huge bonus. I would be honored to win Kathie’s art but would also be thrilled to win the supplies. I will be registering for the class this weekend. ‘This technique was notably used in the Fayum mummy portraits from Egypt around 100–300 AD, in the Blachernitissa and other early icons, as well as in many works of 20th-century North American artists, including Jasper Johns, Tony Scherman, Mark Perlman, and Fernando Leal Audirac. Kut-kut, a lost art of the Philippines, implements sgraffito and encaustic techniques. It was practiced by the indigenous tribe of Samar island around 1600 to 1800. Artists in the Mexican muralism movement, such as Diego Rivera and Jean Charlot sometimes used encaustic painting. The Belgian artist James Ensor also experimented with encaustic. It has quite a storied history! In about 5 minutes, I will have linked the course to my Twitter, Instagram and Pinterest accounts. Oh, wow, the art supplies are to die for. What fun to make a lovely picture like those above. thanks so much for the chance. Working with wax is high on my list to try next. I’m interested in encaustics! Wonderful giveaways. Happy Spring ! This will be my first class and also a first working with this wax as a medium! I’m excited to try something new and looking for to the inspiration !! Thank you for the opportunity ! I want to learn encaustic next and then soldering. Thanks for the class and the chance to win! I would like to learn watercolor painting. It is so pretty, but not very forgiving. Once its on, its on! I have just learned how to knit I made a felted purse. I also just tried a dabble into locker hooking. So far I have made a recycled sari scarf bracelet. I have used bees wax for mixed media projects but never encaustic. I would love to try that! Thanks for chance to win. So beautiful. I have started to experiment with encaustics, just to add depth to oil and acrylic based paintings, and I really know nothing about how to use it to full extent. I am so looking forward to your course. I love encaustic but have never mastered it – this could be my chance???? So drawn to this class. I would love to win! Oh, I forgot to say that I “pinned” it! Would love to learn more about technique with encaustics! Thanks for the chance! I really want to explore watercolors! I am eager to explore encaustic, and I am also thinking about handmade paper sculptures as a base for it after I learn about the plaster. Thanks for having this giveaway! Looking forward to the class.